We've rebuilt the reports experience with a focus on deeper business insights. You'll find the new reports to be clearly organized, more comprehensive, and easy to understand. 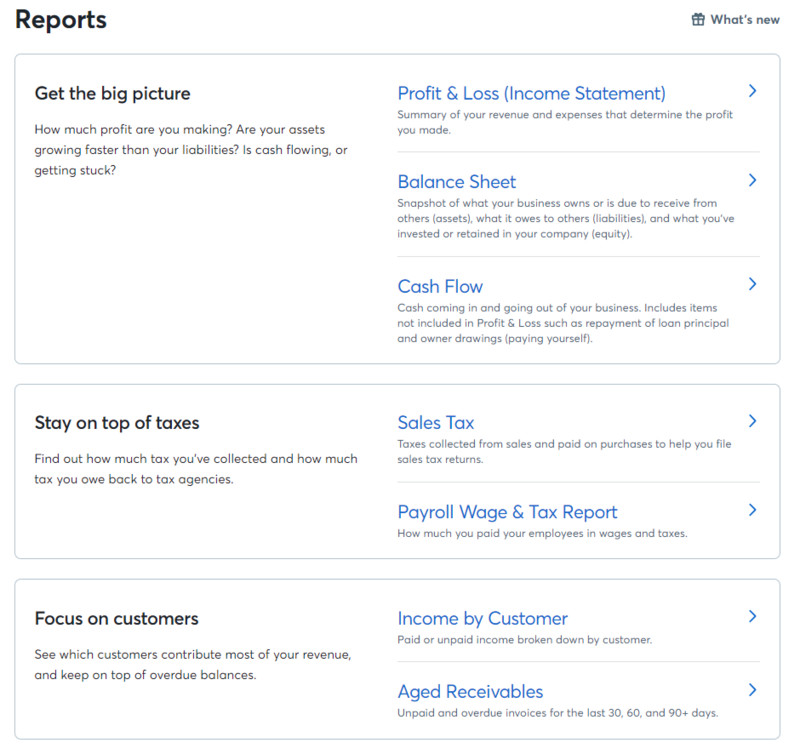 You’ll find that your Reports landing page has been reorganized into five new sections: Get the big picture, Stay on top of taxes, Focus on customers, Focus on vendors, and Dig Deeper. With the update, some reports have been renamed or removed, and others have been consolidated. We’ll dive into all of the changes below! Your Profit & Loss Statement (previously referred to as the Income Statement) has been restructured a little but is still the place to be to reference your total income and expenses for a selected period. Total Income, Cost of Goods Sold, and Operating Expenses now appear at the top of the report along with the Net Profit for the date range you have selected. When you first generate the report, you’ll see the summary version up top, which gives you a simple breakdown of your total income, minus total cost of goods sold, minus total operating expenses, generating the net profit total. The report itself will now automatically calculate your gross and net profit margins for the reporting period. Clicking on Show Details will expand each section to show your income and expenses broken down by account. Often you may wish to compare reporting periods. Prior to our upgrade, you would have needed to generate two reports for two separate periods. Now, your Profit & Loss Statement offers our new comparative reporting feature. You can select two date ranges and Wave will generate the total change amount and percentage. Your Balance Sheet has not changed significantly in form or function, but we’ve done our best to ensure it’s as intuitive as possible. At the top of the report, we’ve included a display of the total funds between cash and bank accounts, your accounts receivable, and accounts payable. This was added provide you with an overall picture of the value of your business at a given time. You will notice that this summary does not include your long-term assets and long-term liabilities. Think of this number as a quick check-in into your short-term liquidity; ie. can the business meet its short-term obligations? As with your P&L, when you generate a Balance Sheet, you’ll first see an overview with a simple breakdown of your assets, liabilities, and equity. Clicking Show Details will expand the report to show you the specific accounts that feed into the totals for each. We’ve added a great deal of detail to the Retained Earnings section under Equity to give you a clearer picture of your business' value with each Balance Sheet that you generate. Your Account Transactions Report now offers a transaction list together with a detailed view that was previously found within your General Ledger. Where, before the update, it was only possible to generate the report for one account at a time, it is now possible to see all of your accounts at once, with the option to filter for a single account. The report can also be generated based on the accounting reporting method that you prefer: accrual, cash & cash equivalents, or cash only. Our aim with the new Account Transactions report is to provide as much detail about each account as possible. The header for each account will now show you the account type, and where it can be found in your Chart of Accounts. Each account’s totals will also be broken down by the starting balance and balance change to give you better visibility into your business progress. The Cash Flow Statement is entirely new to Wave and is designed to help you gain new a perspective of your business. Using this report, you’ll be able to see how much useable cash is available to your business at a given time. While Wave is primarily an accrual accounting system, we’ve introduced the Cash Flow Statement to give you a fuller picture of the money moving in and out of your business. At the top of the report, you’ll see the Net Cash Change for the reporting period you have selected. This measures your cash inflow less your cash outflow to provide you with an understanding of how much actual cash you brought in after expenditures. As with your Profit & Loss statement, you can use the new comparative reporting feature to compare the net cash change between two periods and see a breakdown of the difference in cash flow by account type in the summary view. The Cash Flow Statement measures all inflow and outflow based on the date cash moved into or out of an account. Just like before the update, the Sales Tax Report contains a complete record of all of the sales taxes that have been applied to your transactions, invoices, and bills, but we've added one crucial feature: Sales tax reporting on a cash basis. If you're doing business in a region that conducts tax reporting on a cash basis (and it's worth checking with your local and federal tax authorities to see if that's the case where you are) you can now choose to generate a Sales Tax Report on either an accrual or cash basis. Just change the report type at the top of the page as needed. Wave now has an Account Balances Report in place of what used to be the summary page of the General Ledger. In this report, you’ll find each of your account balances in one place. You'll be able to view a breakdown of the ending balance for each account, as well as the debits, credits, and net movement that occurred between the ending date of the report and the account’s starting balance. Net Movement refers to the increase in an account’s balance minus the decrease. The net movement and ending balance calculation uses what's called normal balances. For an asset account, because a debit increases the account’s balance net movement equals debits minus credits, while for a liability report where the opposite is the case, net movement equals credits minus debits. The Trial Balance report provides a similar breakdown of the balances of your accounts with one key difference: Account Balances does not populate in relation to the date of your fiscal year-end, while Trial Balance does. The balances that you’ll see in the Account Balances page are determined by the date range that is set when generating the report, while the balances in Trial Balance are determined by the closing date of the report, and the start date of your fiscal year. The Aged Receivables Report (which lets you know how much money is due to you and who owes it) and the Aged Payables Report (which tells you how much you owe and to whom) have both received some updates for visual clarity. The Aged Receivables report can give you a picture of the income you can expect, and overdue amounts where it may be time to send a reminder. Aged Payables provides you with a breakdown of your bills, who they are owed to, and which (if any) are overdue. You did it! You now know everything there is to know about the updates to Wave's Reports page.